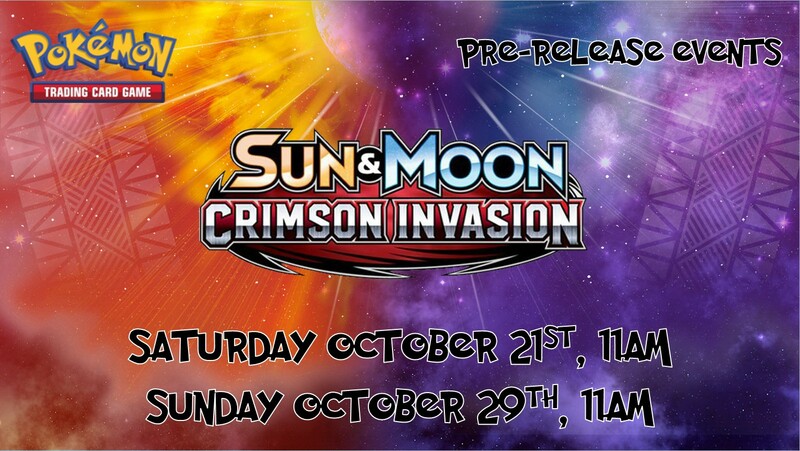 Join us for the exciting pre-release of Crimson Invasion, the 4th set of Pokemon Sun & Moon. There are dates for this event–Saturday October 21st and Sunday October 29th. Each player will receive a Crimson Invasion pre-release kit containing 4 booster packs of Pokemon Crimson Invasion, a Promo card, and a special Evolution pack. At the completion of the event, each player will receive an additional 3 Crimson Invasion booster packs. On-site registration begins at 10:00AM and the actual event begins at 11:00AM. Pre-registration before the day of the event is strongly recommended as Pokemon pre-releases do sell out. Each event will be capped at 52 total players. Pokemon pre-releases are very casual, fun events where players get to open new product prior to the set launch.